Let us look into 5 star Hotels of Rajasthan as Wedding Venues-their pros and cons! With a very particular focus on the 5 star hotels in Rajasthan, specifically in the cities-, Jodhpur, Udaipur, let us see which are the best options you have to organize your wedding. We will discuss this city wise and analyse them as well for you to decide and pick up the best option. Jaisalmer-Rajasthan being desert state experiences severe winters and summers.Sand dune weddings of Jaisalmer are most popular destination weddings of Rajasthan. 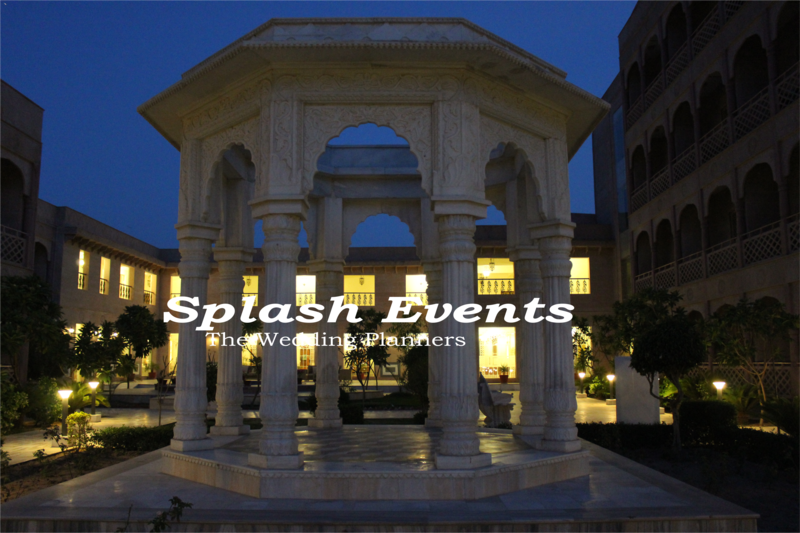 Jaisalmer’s Rangmahal Palace and Gorbandh Palace are great options – 5 star hotels as wedding venues of Rajasthan. These places offer sand dune theme, camp fire theme and camel safari as your wedding entertainment as well. Udaipur- the most preferred destination wedding city of the world. The reason no doubt is the beauty of this place which is highlighted by the beautiful lakes all over the city.Udaipur also known as City of Lakes has been witness to very beautiful destination weddings of India and of NRI’s as well. There is lake pichola, fateh sagar lake –covered by green mountains all over.The options of 5 star hotel as wedding venues in Udaipur can be Radisson Blue, Oberoi Uday Vilaas ,Ramada, Ananta. Kumbalgarh-is a tourist place near Udaipur.5 star property in Kumbalgarh is kumbabhag which can be a great choice for a destination wedding. This place also is close to Udaipur, Ahmedabad, and Baroda and hence is popular as destination wedding venue of Rajasthan in Gujarat as well. Jaipur-as we all know is the most favourite destination wedding venue. There are lot of 5 star hotels in Jaipur which are loved as destination wedding venues. Read the details of the same at 5 star hotels in Jaipur as wedding venues. You can go through all these categories of wedding venues in Rajasthan and based on your choice and convenience you can select the best. Finding a perfect wedding venue requires a structured venue analysis, we will tell you how! The foremost of wedding planning is deciding the wedding venue. And this task of finding , wedding venues is extra ordinary difficult. The easy options that come to our mind are hotels, resorts, open gardens, banquets. At the initial level these options appear to be fulfilling all the requirements, but when we analyse it further lot of aspects of wedding planning are left untouched here. Few but very important points that can really help in giving the wedding a heritage , royal and a modern look.